Even though the big toe is only a small part of your body, if it becomes stiff and painful it can make it difficult to walk normlly. Hallux is a term used by podiatrists for the big toe. Hallux limitus is a condition that involves the joint at the base of the big toe, which is called the ‘first metatarsophalangeal’ joint of the foot. Normally, when you are standing the big toe can be bent upwards and this movement occurs pain-free and unrestricted. During walking the big toe must bend upwards and ‘dorsiflex’ so that the foot can roll over the top and push off the ground. This is important during walking so that the body can generate power to move forwards. If this movement does not occur it will put strain on other parts of the leg and foot and overtime may also cause pain or muscle fatigue. 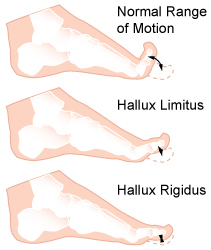 Initially, hallux limitus may have no symptoms but as the condition progresses symptoms may present. The most common symptom is a stiff or painful big toe, especially when walking and pushing the foot off the ground. Hallux limitus is classed as a degenerative joint disease and as the condition progresses changes occur to the two bones of the joint. Commonly, a bony bump may form like a collar over the top of the joint. Once bony changes occur they will cause a permanent decrease in how far the toe can bend upwards and if not managed correctly further deterioration of the bones of the joint will occur. To diagnose hallux limitus a podiatrist will need to carry out a physical assessment of the foot. Treatment is aimed at restoring function of the big toe joint and limiting the progression of the bony changes. Treatment and management of this condition involves footwear advice including shoes that do not restrict the toes or opting for a stiff soled shoe, orthotics to support the big toe joint and facilitate its function when walking, pain management strategies, and lastly exercises and stretches to keep the joint mobile.